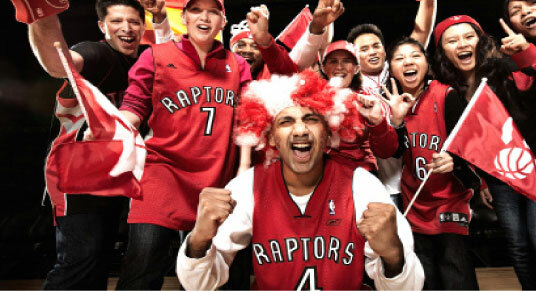 For the fourth straight year, the Toronto Raptors are recognizing the importance of the burgeoning Iranian-Canadian community. In addition to hosting “Iranian Night” on February 20th in a game against the Memphis Grizzlies – where fans can get a discount on tickets by entering the promo code “IRAN” when making their purchase – there will be a basketball clinic for children this Saturday, focused again on attracting the Iranian community. The basic idea is to get people from the community to get more active and inspire more people to play basketball, according to Neda Tabatabaie, Director of CRM and Research at Maple Leaf Sports and Entertainment, which owns the Raptors, as well as the NHL’s Maple Leafs and MLSE’s Toronto FC. For Raptors coach Dwayne Casey, hi s second year with the team, these efforts to connect with communities are important. In a unique twist to events, only two weeks ago the Raptors acquired the only Iranian-born player in the NBA, 7 foot-2 inch centre Hammed Haddadi. Unfortunately due to immigration issues the 27-year old Haddadi has been unable to report to the team as of yet, and Salam Toronto was requested to avoid asking any questions pertaining to the Ahvaz-born player. While Casey has not personally played with or coached Iranian players himself, he stated that their profile in the international game has increased significantly over the years. As a former coach of the Japanese National team, he lived in that country for a couple of years and understands the cultural barriers present for a foreigner. In addition to the free basketball clinic for 8-14 year olds offered this weekend, this will also be the first year the Raptors are partnering with the Tigan festival. A portion of the proceeds of ticket sales will be going to the festival. As for the game itself, organizers are expecting solid numbers. Each year the event has grown, from only a small group in year one to last year, where there were about 350 documented people from the community. That number is conservative, however, as the team can only officially track the numbers through those that purchase tickets through the promo code. Tabatabaie believes the number is considerably higher. This year’s game has added importance as it pits the Raptors against the Memphis Grizzlies – a contender and also new Raptors Haddadi and star Rudy Gay’s old team. Tabatabaie says MLSE executives have been very receptive to the Iranian night, and bigger plans are possible for future events, such as a Persian-inspired half-time show. This year’s game will include signage as well as announcements honouring the community. A couple of years ago one of the play-by-play announcers even spoke some Farsi. Raptors coach Dwayne Casey, meanwhile, emphasizes the positive effect of cultural nights such as, a reflection of the city in which we live in.